Plebiscite 2004: Citizens of the World, Vote for United States President! ¡Ciudadanos del mundo, voten por el presidente de los Estados Unidos! Citizens of the World, Vote for United States President! Citoyens du monde, Votez pour le Président des Etats-Unis! George Bush 51%, John Kerry 48%. Plebiscite2004 was part of an extraordinary world-wide network of self-generated and self-organized voting projects related to the 2004 U.S. presidential election. Hundreds of thousands of people voted online and thousands more voted in-person. Links to some of those projects are listed in the green box on the left, below. Artist Michael Rakowitz organized a voting project entitled Test Ballot: Examining the Faulty Machinery of Democracy for installation with the Kunstraum Innsbruck / stadtturmgalerie Innsbruck in Austria. "15 of the controversial Votamatic voting machines used in the 2000 presidential elections in Palm Beach County, Florida have been exported to various locations. The Global Community is invited to vote in the 2004 election of the President of the United States of America on the Second day of November, Two Thousand and Four." Locations included INNSBRUCK, CHISINAU, PARIS, VIENNA, GRAZ, BARCELONA, MILANO, ATHENS, LJUBLJANA and GDANSK. For information on polling station locations click here. For a pdf of the full press release, click here. Leader of the Free World - A sophisticated polling site that allowed for proportional voting for over 60 candidates. Beta Vote - Only allowed votes to be cast for Bush or Kerry but had a great instant polling sorted by nation feature. King of the World - French site that also had a petition to be signed and sent to the U.S. Government. 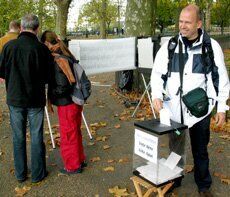 GlobalVote2004 - UK-based polling site. As of 2008, "The World Votes" site is no longer available. A team of individuals based in The Hague, The Netherlands created an online polling system called The World Votes. You were able to register to vote by filling out the interactive banner above. The team also coordinated a web portal, The World Speaks, for the discussion of issues related to democracy, the U.S. presidential elections, and exchange between citizens of the U.S. and other nations. All persons over the age of 18 who did not have the right to vote in the 2004 U.S. election were cordially invited to cast their vote for United States President. Plebiscite polling stations were set up at key locations around the world to allow non-U.S. citizens to cast their votes for United States President. U.S. citizens voted in the general U.S election. Both U.S. citizens and non-U.S. citizens were invited to fill out questionnaires about the plebiscite project and the various issues about the nature of democracy that it raises. The results were hand-tabulated in a public performance on November 2, 2004 at Beaconsfield, an arts center located in Vauxhall, London. Those results were publicly posted electronically, here, on this plebiscite.org website. The Freedom of Expression National Monument is co-presented by Creativetime and the Lower Manhattan Cultural Council. Plebiscite 2004 was an experiment in radical republicanism in the spirit of the work of the great revolutionaries of the eighteenth century. Its goal was, and is, to signal a pragmatic vision for the expansion of political enfranchisement around the world. ALL PEOPLE have the right to participate democratically in decisions that effect their lives and well-being. 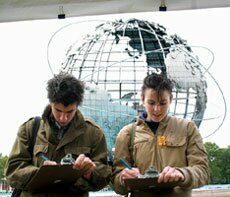 Plebiscite 2004 created a dialogue between U.S. citizens and citizens from other countries around the world about the nature and boundaries of democracy. Who gets to Vote? Why? What are the requirements, rights and responsibilities of citizenship? How can we work to bring more democracy into the world? London as part of Plebiscite 2004. Plebiscite2004 is a pro-democracy project that is not in any way affiliated with the government of the United States of America nor the government of any State or City in the United States. Plebiscite2004 counted your vote, but the United States Constitution and the laws of each State do not currently allow the government to do so. at the Unisphere, Flushing Meadows, Queens, October 16th and 17th, 2004.
at Tower Bridge, Parliament Square and Tottenham Court Road Tube Station, London, England, November 2, 2004. Plebiscite2004 was part of an extraordinary world-wide network of self-generated and self-organized voting projects related to the 2004 U.S. presidential election. Each of these projects was itself a network of volunteers. Plebiscite2004 itself came together with the aid of dozens of volunteers and hundreds of voters, each of whom deserve thanks. A special appreciation goes out to each of the individuals who cast a vote in Plebiscite 2004 and to each of the questionnaire respondents. They made an idea become a reality. Thanks also to the polling station volunteers at each of the seven different sites. At theUnisphere in Queens, thanks to Deidre Hoguet, Helen Gyger, Lorena Rivera, Hope Ginsberg, Michael Cataldi, Amanda Matles, Jason Crump, Kenji Szczepanski, Pilar Rau and Meg Walsh. An extra hats-off to Lorena and Pilar for being the official Spanish translators for the station. Thanks to Deidre Hoguet and Christopher Quirk for their help at the Freedom of Expression National Monument in Manhattan. On election day in London, the various stations were run with the help of Susan Kelly, Zuky Serper, Alana Jelinek and Yael Cohen. Susan and Zuky were particularly helpful with helping negotiate the mobile polling station through the London tube. Thanks! And of course, the day was made particularly memorable by the support given at Parliament Square by the indefatigable Brian Haw, who has been camped in front of Parliament for three years and who defended us from the onslaughts of various officials and partisan spectators. The vote count on the Moral Plinth at Beaconsfield in London was a great success due to the help of the entire Beaconsfield staff, most notably David Crawforth, Julie Clark and Naomi. Their support anchored the project and was indispensable. The Count itself was graced by the participation of Louise Stern, Carrie Braman and Dana Visser who made sure there were no hanging chads and brought the pleasant addition of a sign language translation to the festivities. In New York, Chris Dunn and Art Eisenberg at the New York Civil Liberties Union were instrumental in allowing the polling station to be set up in Flushing Meadows/Corona Park. Without their help we might have been unable to collect the important votes of those communities. Thanks also to Patricia Hamilton at the Parks Department. Stephen Watt of the Center for Constitutional Rights in New York provided a valuable contact in London in the person of barrister Henrietta Hill. The staff at Liberty and their “Know Your Rights” website were also very helpful. Thanks to you all. Without a doubt, artist Susan Kelly in London made the biggest contribution to the planning process for the project’s iimplementation there. She graciously made her entire network of artists and activists available, allowed artist Peter Walsh to crash at her place and spent the entirety of Election Day working on the project. Thanks Susan! Also in London, Zuky Serper was wonderful, taking photos and helping on November 2nd. Susan, Zuky, Guy Taylor at Global Resistance, Hannes Rox, Jesse Ash and Jaime Gili all provided excellent advance advice by e-mail during the planning stages of the project. In New York, Tom Finkelpearl at the Queens Museum of Art, Anthony Huberman at Sculpture Center, Tea Rozman at RACCOON, Cheryl Wertz at NICE and Ian Hart all gave support and sage advice on how to bring the project into being in New York. Erin Donnelly at the Lower Manhattan Cultural Council and Vardit Goss at CreativeTime invited the project to set up at the Freedom of Expression National Monument at Foley Square in Manhattan and their help is much appreciated. Miguel Garcia and his daughter Maria provided the Spanish translation for the call for volunteers and Gordon Sinclair of Codeinc, who claimed that all Canadians were planning to vote for Ralph Nader, provided the all important Ballot Box. In the summer of 2004, I saw a wonderful election-based performance in Puerto Rico by Buenos Aires-based artist Florencia Reina. The project featured a vote count at a bingo hall in Añasco that completely convinced me of the theatrical power of counting votes. Thanks go out to Florencia plus best wishes and hopes for more great projects. Artist Mike Rakowitz, who created his own voting project Test Ballot, gave great early support to the idea of Plebiscite2004 and collaborated extensively in the planning and coordination between the various voting projects. Bart La Croix at The World Votes was a strong contact too and thanks go out to him and to all the teams that put together the various voting projects.